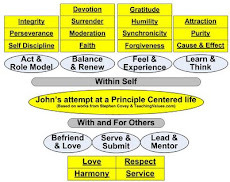 Give2Attain: Humans Replaced by Automatons? Here is another excellent post idea from Laurie. It asks the very real question, how will we humans justify our "income" when the the robots are doing most of the "work" in the world. I have often wondered if our future society will look like Star Trek or Blade Runner. Will all humans live fruitful lives and be well taken care of, or will the "wealthy/capital holders" live large while the majority live in squalor? I mean in Wall-E the humans became fat and lazy, and there certainly weren't 6+ billion of them on the ship. Who made it on the ship and what happened to the rest? Lord knows we are already on the path to obsoleting a whole lot of jobs. (ie weld robots, ATMs, self scan grocery kiosks, streaming videos, tax software, autonomous mining trucks, etc, etc, etc) And NO, the replacement jobs do not require as many people and/or pay as well, otherwise we wouldn't have built the machine/automation. 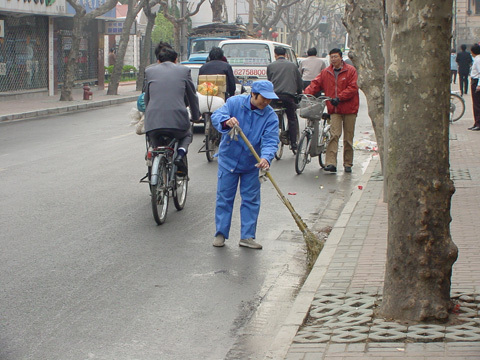 Here is a photo of a street sweeper in China. That is apparently one way to keep people employed, however in America folks would demand that the person be paid $10 / hr and the accountants would go buy a piece of equipment that can replace 1000 guys with a broom. So what do you think the future holds? Those are two of the visions: There is the dystopian future, Blade Runner, or particularly Soylent Green, with it's depiction of a small ruling class living in luxury, dominating a controlling a much larger population living in poverty. That seems to be the current trend. Or there is the Star Trek vision, a world where technology has made work redundant, a world without money, by the way, where everyone has the freedom to pursue higher things, to go places where they haven't gone before, like maybe Cleveland. I have to agree with you that it looks like we are heading for the Blade Runner future. A world of haves and have nots. And if they squander their "share of capital", do we let them go hungry or do we keep giving them more? As a Trekkie, I would note that the pivotal point occurred in a two part Deep Space Nine episodes, Past Tense, parts I and II from the third season. I believe all Star trek episodes are available on Netflix streaming so you streamers might want to check them out. Any hints as to what "pivotal point" we would be looking for? Do humans finally become immune to the 7 deadly sins that cause strife within and between human societies? They are eventful episodes. And somewhat rare in the Star Trek canon where there aren't that many episodes set on Earth or have to do with Earth history. In the Star Trek universe, at the very least, they have built up a resistance to them. Of course, the Feringhi keep many of them alive. And don't forget those power hungry Changelings, Cardassians, etc. I saw the new Star Trek movie last night. I thought it was very good. I also thought it was interesting that there were no droids, robots, etc in the movie. They didn't even using talking computers. It shouldn't have been a surprise after watching Star Trek for decades, however I definitely took note after this discussion. As a dedicated Trekkie myself of longstanding, one of the things I must enjoy is the things Trek misses about the future. The computers in original Trek are very primitive. And the computers, even the desktops, in TNG are very clunky and limited. DS9 is full of iPads which seem to be dedicated to doing only one thing. One thing I loved about the new Star Trek movie is that at long last someone has invented the seat belt. This after hundreds of Trek episodes, it seems to me, when various vessels come under attack, and it seems to occur to no one that it might be a good idea to tie oneself down to one's seat. The other thing Star Trek definitely needed was some sort of fire retardant technology for their control panels. Star Trek is a world in which Steve Jobs, it seems, was never born. There's one Star Trek where Geordi, on a mission alone, asks a computer to play some music and it does. Cool. Star Trek was the creation of Gene Roddenberry and reflects many of his values and attitudes even today. But then came along Data. However I agree that interactive computers were definitely rare. Data was more narrative device than computer. Like Spock, like the Ferenghi, he was among the more human characters in the show.